The figure below is a swimming pool which has a length of 15 m and a width of 12 m. There is a 2 m wide path around the pool. If the cost of the path is $5 per , what is the cost of the path? The cost of the path is $ . 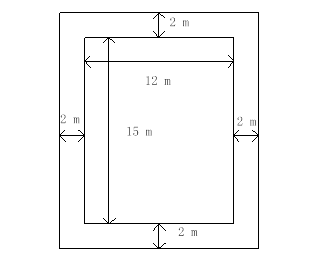 The area of the path can be calculated from the bigger rectangle and the smaller one. So the area is (15 + 2 + 2) × (12 + 2 + 2) – 15 × 12 = 124 m2.